Today I show you how to quickly defrost a turkey. Forgot to take the turkey out of your freezer last night? Don’t panic! Simply follow the step by step instructions to quickly defrost your turkey. This method is incredibly fast! Within 10 minutes your turkey will be fully thawed out and ready to be cooked. 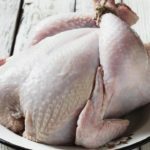 This method can also be used on chicken, steak, and various other meats. Merry Christmas!